So many battles, so much to tell, Commanders. 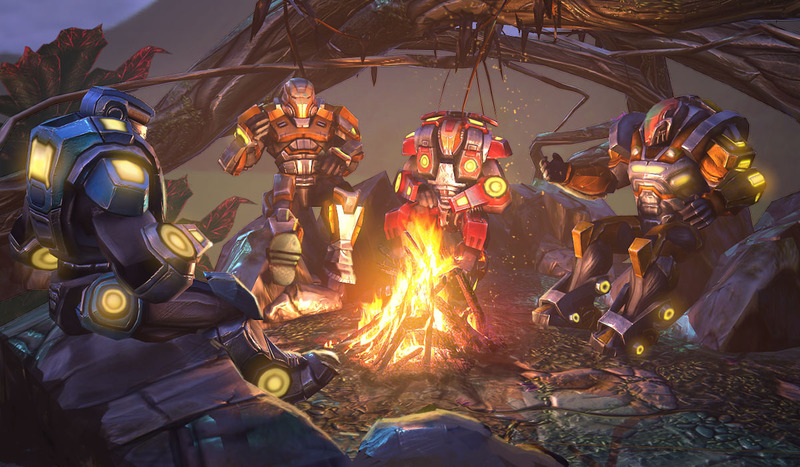 With summer expeditions on their way, more squads leave the base for the wilds every day, and when another mission is successfully finished, what better time to gather around blazing campfire and trade stories. Do you have a fight that you remember turn by turn? PvP attack that ended on the last second with total victory? Tell us all about them! Until June 24th, post your stories in this thread, add user ID and get a free Mk. II chip plus 10.000 credits. Next Friday, we will pick 3 winners who will get a powerful Mk. III chip with 30.000 credits. Michael: So how should I start with this... I suppose front the start. We were out in charge of investigating a abandoned alliance supply warehouse and to put it simply it didn't go well, we entered the building and it looked like it has not seen a cleaner in decades with the roof not existing anymore, the floor having a hole and no sign of our much needed supplies so we were in a really bad position and command really wanted us to investigate and I have no idea why specifically us. Michael: Ahhhh much better........ so we splinted up and searched the place without any luck we found only dead corpses of old alliance soldiers and a broken robot but then it got interesting, our heavy went down the hole in the floor and found a bunch of medical supplies which are worth a lot but unfortunately for us we got ambushed by a bunch of raiders and the b@stards put up quite a fight and they were not your ordinary morons of the deep they were Jericho erupted morons and they were equipped with quite the gear but unlucky for them we were also equipped with good stuff, even when the alliance hear seems like old fragile cr@p for most of the part the guns still pack a punch and the morons didn't think we would be this heavily equipped. But then sh!t hit the fan with more force than ever. Michael: The entire warehouse became a war ground with grenades and bullets flyng every where and those Jericho soldiers didn't think twice on pulling the trigger with the guns they had...... when we managed to take them out we were out of ammo and exhausted, we didn't even have grenades left but the drop ship came in just in time and we ended up having a nice rest but our sniper got radiation poisioning so she will be out for a while. I on the other hand still don't know why those idiots attacked us in the first place hell last time I heard their base was blown to pieces or so they tell, you can never be sure when your speaking to a bartender on a Sunday night. Michael: This is Copral Michael Sanders of the third recon squad log out. Last edited by ADVENT; 18-06-16, 14:58. There is a small little fanfict of sorts I made. When one of my heavies went toe to toe with a juggernaut and a shadow. Ended up on top with less than 50 health left. It was a stormy summer night..
A team of 4 storming the rival corp's base. The scout advances step by step as a team of snipers right behind is waiting to execute. Step by step forward, seeking the enemy. Until the trap is sprung. The scout falls back, and the enemy follows. Over watch snipers shoot, and shields sparkle. Until the enemy scout throws a pop corn bag. Wait. It's not a pop corn bag. It has a fuse. A grenade. What kind? The explosive one, no doubt. And the grenade explodes In a puff of white smoke, covering all Bebonizers Inc mercenaries. They are stunned. Figuratively and materially. And the game is lost. Since then, Bebonizers Inc fabricates stun grenades by the cart load.